Inshore water temperatures are in the low to mid-50s in the Little River area, and the water is gin clear. 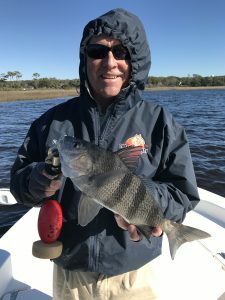 The big three winter inshore species are all biting well in the ICW, creeks and tributaries around Little River, with Captain Patrick “Smiley” Kelly (843-361-7445) reporting good catches of black drum, redfish and speckled sea trout. Redfish are eating both shrimp and Gulp! 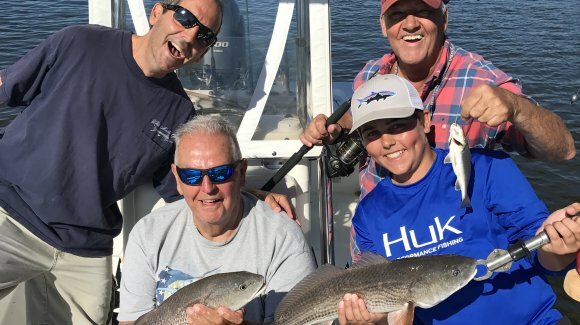 baits, and they are being caught on the low to rising tide around docks and oyster beds in shallow areas with about 5 feet of water or less. Most of the fish are in the 15-20 inch slot-size range, and they are doing a lot of “dock-hopping” from one good looking dock to another. Black drum are being caught in the same areas and on the same tides as the redfish, but they are pretty much being caught on shrimp. On the other end of the tide spectrum, on the end of the rising tide and when the water is just starting to fall trout are biting well on Mirrolures. Anglers can either cast or troll the lures, and fishing moving water around creek mouths and ledges is the best bet. 6-8 feet has been the most productive depth.